The main floor of this nicely furnished condo has a light-filled living room with a vaulted ceiling, wood-burning fireplace (wood included) and a flat screen TV with over 60 HD channels. A DVD player, VCR and stereo system are also included. The shelves are stocked with a variety of books, games, videos and DVDs appropriate for both adults and children. The dining area has an expandable table that seats up to 10 guests with two additional places at the bar. The adjacent private patio has a gas grill and outdoor furniture for use during the warm months. 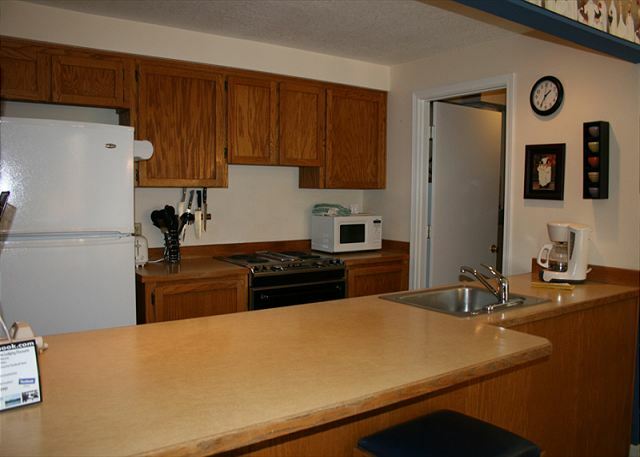 The fully stocked kitchen includes many extras such as a coffee grinder, stand mixer and slow cooker. A washer and dryer are in the attached laundry/utility room. 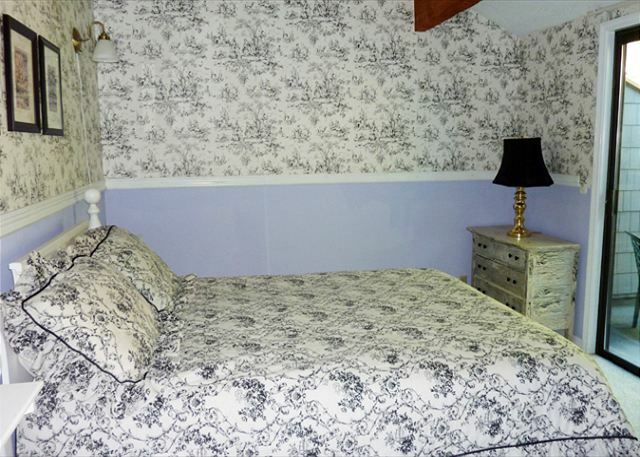 The main floor also has a full bath and an attractive bedroom with a window seat. 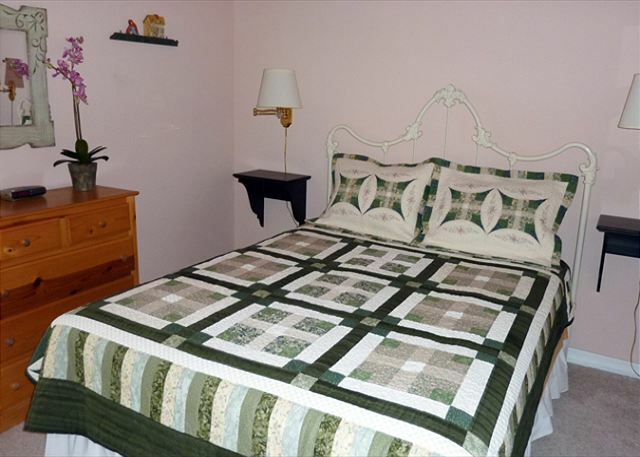 The comfortable queen bed is covered with a cozy, custom-made quilt. Two additional bedrooms and a full bath are located on the second floor. One of the bedrooms has a comfortable queen bed, TV and private balcony overlooking trees on the grassy lawn below. 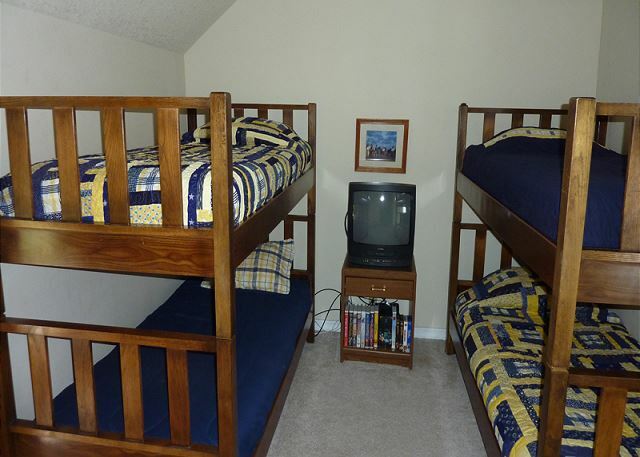 The second bedroom has two sets of bunk beds, TV and VCR. 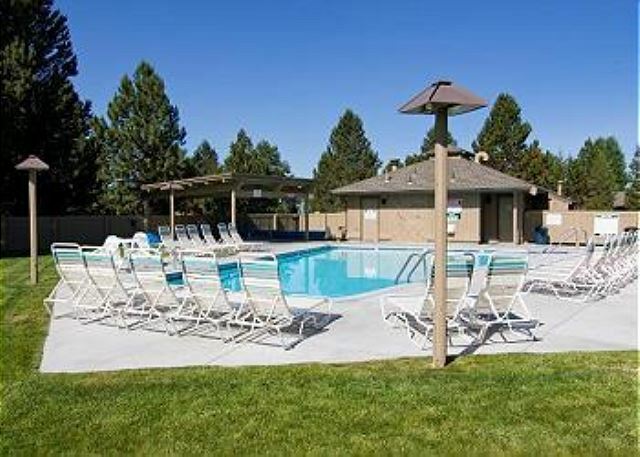 The unit is in a quiet location with free WiFi, four adult bikes, carport and easy access to Sunriver’s many bike paths. The Quelah condominium complex has its own seasonal pool, tennis courts, kids’ pool and shared hot tub. 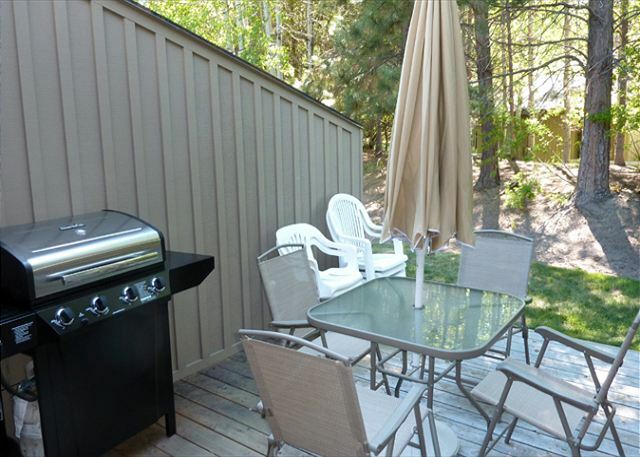 Ideally located, it is within walking distance the Nature Center, Mall, SHARC and many other Sunriver amenities. 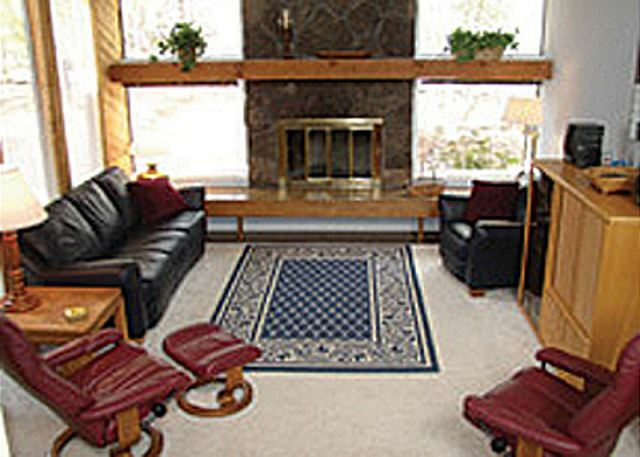 2 Queens, 2 Sets of Bunks, D/W, W/D, microwave, 3TVs/2VCRs, DVD player, CD stereo, 2 levels, fireplace, gas BBQ, carport, 4 adult bikes, access to condo HOT TUB year-round, pool & tennis in season, 1481 sq ft, 8 Unlimited SHARC passes. This condo is in a great location, especially in the hot weather. We had lots of trees to the west, giving us afternoon shade. Since it was 90 degrees or more daily this was very much appreciated. The interior of the condo is just what we need as far as floor plan goes--master bedroom with bath downstairs and two bedrooms and a bath upstairs. 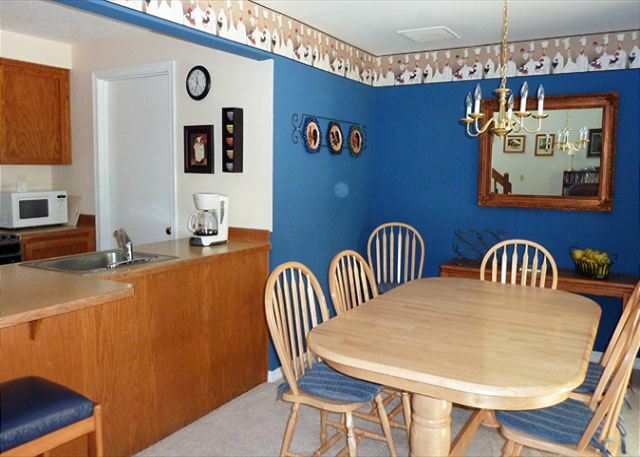 The decor leaves a lot to be desired (lots of wall paper, carpet that is stained, some cobwebs, etc.). Also, the dishwasher and clothes dryer are extremely noisy. With that said, these were not things that made our stay disappointing. On the contrary, this was a great time for us, our daughter, and three grandkids. Thank You for your review, Chris! It sounds like you had a great time with your family at the Condo. We hope to see you again soon! This place was perfect for our family of 5, and a great location for all things Sunriver. The kitchen has a new stove/oven and microwave, and all the tools we needed. Place has a huge TV and plenty of furniture for entertaining. Extra bonues: 4 bikes (with locks), SHARC passes and unlimited access to the Quelah pool, hot tub and tennis courts. Perfect place for families! Thank You for the 5 star Review, Theresa! We are happy to hear that you had a wonderful time and enjoyed Quelah 11, the Sharc passes and the condo pool and tennis...Come back soon! Overall this place is great with access to a pool and jacuzzi!!! We vacationed with 3 kids and the only thing that needs to be changed is the vertical wooden bars that are part of the guardrail on the stairs and 2nd level--the space is too wide and a toddler can easily fit his/her's head through it. Other than that, great place to stay!!! Love the pool, jacuzzi and it even has a wading pool for the young ones!! Will definitely be back if the guardrail spacing is changed. Thank You for your review, Byron! We are so glad to hear that you enjoyed the property and we hope to see you in Sunriver again, soon! Quelah is an older condo with a private, well maintained pool area. The rugs in unit 11 was dirty, stove was old with a very noisy fan. Other furniture and features were fine. Great grassy play area and pool. Perfect location for bike riding and other activities. Thank you for your review Dan! I will follow up with our housekeeping on the cleanliness as it seems it was below our standard for your stay. I will also pass along your message to the owner about the noise fan and see if we can get some new ones for next year. We hope to see you again! The rental was clean and spacious for 7 people. It had a nice kitchen and space for eating meals as well as sitting and relaxing. We are so glad that you had a relaxing time in Quelah Condo 11! Thanks for the review and we hope to see you again real soon in Sunriver! carpet was in need of shampooing...barbecue tank ran out of gas and barbecue was in need of cleaning...accumulated grease in the barbecue caused continuous flair ups. Overall, we had a great time with family and friends! Thanks for your review, Jill!! Our very highest traffic time is in the summer, and unfortunately you came on the tail end of summer and before we could deep clean the carpets and BBQ. We spot clean as best we can over the summer, but there are times when this is not good enough, and we apologize sincerely if that was the case. Don't forget that when you stay with us, your comfort and satisfaction are our FOREMOST priority. So next time you stay, if there is absolutely anything that needs to be cleaned, moved, fixed, removed, added, etc. please call us and let us know. We believe that we've earned our tagline "Service sets us apart" and we want to prove it on a daily basis. Again, thanks for the feedback, Jill! Great location in Quelah Condos. Enjoyed riding the bikes. Good. Enjoyed the bikes and SHARC passes. Nice condo. Quelah Condos are great with their own pool. That Quelah pool sure is a big hit! Thanks for your feedback Merrily! We look forward to your next visit to Sunriver. We had a great time staying at Quelah 11 in Sun River. The convenience of on-site tennis courts, swimming pool and hot tub, plus the 4 bikes included with the condo made our stay very enjoyable. The SHARC passes included made it easy to access the marina for water activities on the river. The bunk bed room was perfect for our 4 girls from 2 families to share and the two other bedrooms were perfect for the parents. There is so much to do in and around Sun River, we will definitely be back! We can't wait to see you again, Nola! Thanks for your business, we TRULY appreciate it and we hope to have the privilege to host you in Sunriver again soon! We had another fantastic stay at SR this year. We have been coming for the Pac Crest Sports Festival for at least a decade. This year we rented in the Quelah Condos for the first time, and we will certainly be back next year. The accommodations were comfortable and homey- we lacked for nothing. We like having the SHARC passes, but it can get crazy over there- so we were thrilled to have access to a private pool. 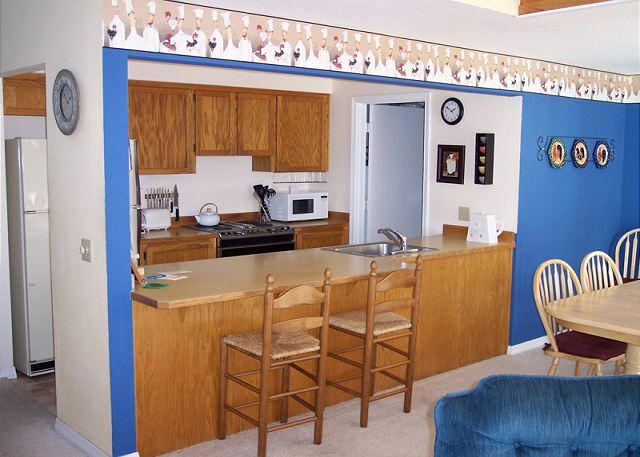 It is an awesome facility- well maintained- with both a regular pool and toddler pool and a hot tub. The condos are set amongst the trees and plenty of grass outside. Our condo was a three bedroom- with one ample room and full bath on the main level. The kitchen, though galley style and on the small side- is open to the main living area, and is fully stocked with everything needed for prepping meals. There were tons of books/games/movies on site, as well as four bicycles. Overall we had an incredible family getaway. We are so pleased that you enjoyed your stay Amy!! We hope to see you again next year, or sooner!